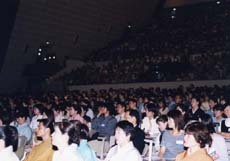 September 5-7, 2003, the 13th triennial national convention of the Seinenbu, or Youth Division, of the Chado Urasenke Tankokai membership organization was held at the Kyoto International Conference Hall (KICH). 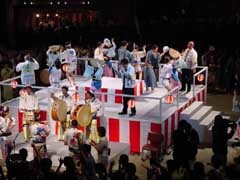 The Seinenbu, consisting of Urasenke chado followers younger than the age of fifty, has a national membership of approximately 15,000. 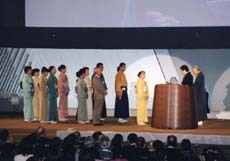 Approximately 2,800 members and invited guests participated in the convention, which simultaneously celebrated the succession of Zabosai as SEN Soshitsu XVI. 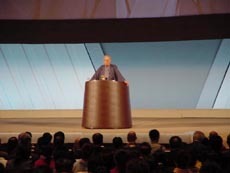 The convention theme was "Let's Discuss the Future, Build the Future, and Live the Future." 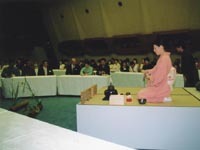 During the two months leading up to the convention, approximately 150 "relay" tea gatherings, using a scroll, teascoop, and teabowl received from Zabosai Iemoto and Hounsai Daisosho at the head house as the "batons," were held around the country by the various groups belonging to the sixteen national Seinenbu districts. 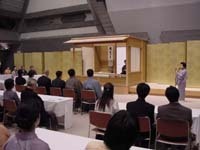 These tea gatherings started from the farthest north and south ends of the nation, and worked their way towards Kyoto. At the Convention Ceremony held in the Main Hall of the KICH on September 6, the "batons" were handed back to Zabosai Iemoto and Hounsai Daisosho. This moment met with a roaring applause. 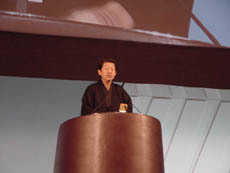 Hounsai, in his address, expressed his thanks that each one in the audience had given thought to the meaning of peace, and was supporting the Iemoto. Zabosai, in his address, said that he will support everyone in their efforts to polish themselves so that they can show the world how splendid the Way of Tea is, and that, together with them, he will strive to polish himself, too. This was followed by an Awards Presentation, recognizing the groups and individuals who showed exceptional achievements during the past three years. 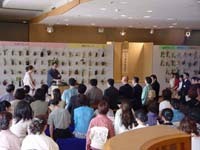 On the first day of the convention, September 5, commemorative tea gatherings were held at six locations in the KICH from 1:00-5:00 P.M. 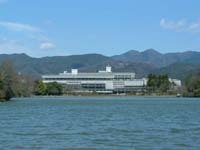 They were hosted by the four Tankokai chapters in Kyoto; the Urasenke Gakuen students; the Tankokai Seinenbu National Committee members; the Tankokai Headquarters Chishinkai members; the Midorikai and Saturday-class groups of non-Japanese who study at Konnichian; and members of the Japan Junior Chamber. 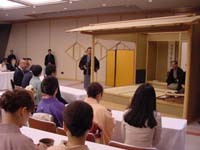 The set of scroll, teascoop, and teabowl that traveled the southern route for the relay tea gatherings was used at the tea by the National Committee members, and the set that traveled the northern route made its appearance at the tea by the Chishinkai members. In the evening, there was a Commemorative Festival in the Main Hall, where the food and beverages consisted of local specialties brought from the sixteen different Seinenbu districts. On September 6, from 8 A.M. the display of items offered for the Charity Sale was open for inspection and bidding. 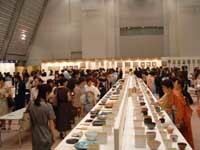 There were approximately 1,000 tea utensils and other chado-related items which had been donated by the Urasenke head family and others. 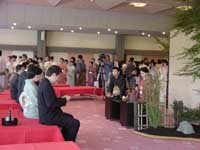 Tea service was available in two other areas of the KICH from 9-noon, sponsored by the Kanto District II and Hokuriku Shin'etsu District members. From noon to 1:00 P.M., chado seminars were held at five locations. 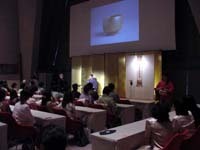 TAKADA Myoho, who is head master at the Daitokuji Monastery Training Center, led a seminar on the theme "Tea and Zen and Daitokuji"; TSUCHIDA Yuko XII, who is one of the ten Senke Jusshoku craft makers whose family has done work for the Sen families through the generations, spoke on "Textiles Used for Tea Caddy Pouches"; OKAMOTO Koichi, a professor at Toyo Eiwa University and specialist in social psychology, led a seminar on "Cultivating Wisdom as a Chado Person"; TSUTSUI Hiroichi, who heads the Konnichian Library and is vice chief of the Chado Research Center, led one entitled "Thin Tea and Thick Tea"; and KURAKAZU Sokaku, a top Konnichian deputy tea master (gyotei), had "Guests' Considerations" as his seminar theme. 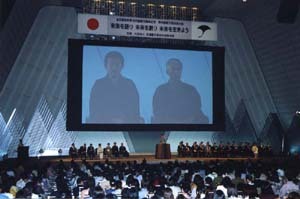 After the Convention Ceremony and Awards Presentation, Hounsai Daisosho gave a forty-minute talk in the Main Hall, which was followed by a question-answer hour where Zabosai Iemoto answered questions that had been gathered from the sixteen Seinenbu districts. In the evening, there was a grand buffet dinner party in the KICH Event Hall, and the winning bids for the Charity Sale were posted. On the final day, September 7, about 750 representatives met in the Main Hall for a three-hour General Meeting of Representatives, to talk about future policies and projects.